Home » Semiconductor » CPU GPU DSP FPGA » AMD’s Financial Analyst Day 2017: On The Cusp Of Greatness Again? 20 May AMD’s Financial Analyst Day 2017: On The Cusp Of Greatness Again? I attended Advanced Micro Devices’ Financial Analyst Day (FAD) last Tuesday at their headquarters in Sunnyvale, CA. While I am not a financial analyst, but rather an industry analyst, I am looking for different signals than that audience, but I have found the financial analyst conferences very informative. AMD has a history of making big announcements at their analyst events, it hadn’t had FAD in two years, it has been on a bit of a roll as of late, so I wasn’t going to miss it. I wrote about the degree at which AMD delivered on their promises from their last Financial Analyst Day in 2015, which you can find here. For this column, I’d like to spend some time here on AMD’s FAD announcements, their importance and my opinion. 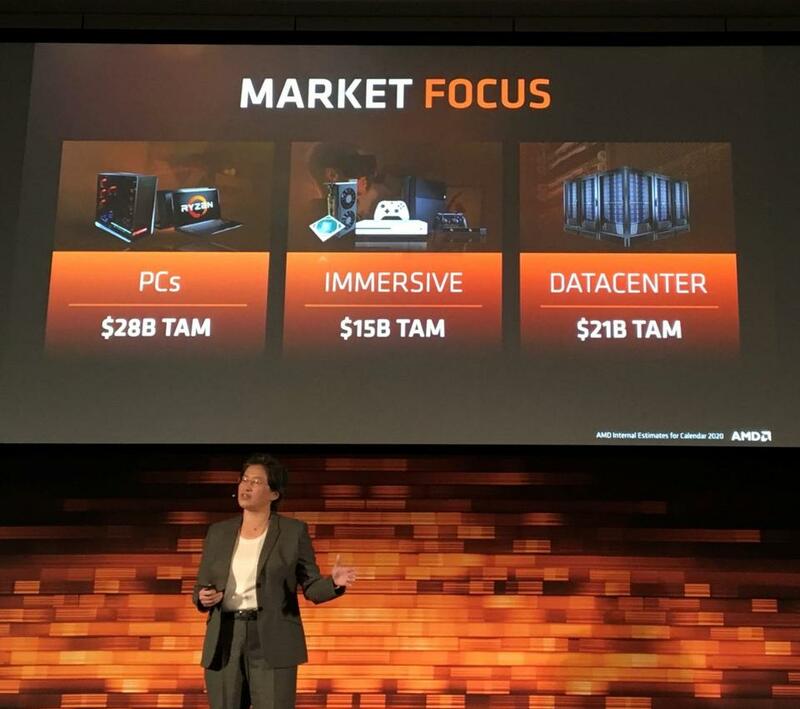 Lisa Su set the bar high, stressing AMD’s commitment to providing “high performance” technologies by setting ambitious goals for the company expanding all the way into 2020. The year 2020 may seem like a long way, but it’s nothing in the chip business. Of note, don’t confuse “high performance computing” with “HPC” as what AMD is saying here is it has the plan to stay in the high-performance product tiers that have much higher prices and margins. AMD’s purpose of FAD was to unveil their plans for high performance computing, high performance PCs, Radeon graphics, and what they call the “new era of the datacenter”. Going forward, 2017 looks to be a huge product year for AMD as they plan to launch several new products in June which it hopes expand margins, revenue growth, and drive profitability. A few things stand in the way of AMD, companies like Intel and NVIDIA, who of course, have success plans of their own. Historically speaking, it’s dangerous to ignore AMD, and those who have, lived to regret it. I’m seeing a different AMD right now, one who has the most goods I’ve seen from them in a decade and they have confidence and clearly nothing to lose. CTO Mark Papermaster got on stage after Su to discuss AMD’s future building blocks and the glue that binds them. Papermaster reinforced the core of AMD lies in “high performance computing” whether it’s the cloud, gaming, or commercial markets and it all starts with the high-tech “salad bar” (my words) ingredients that need to be assembled into real products down the road. AMD released long-term CPU and GPU core roadmaps that expanded through 2020 and I believe these are much more than fantasy bullets on a slide, as Lisa Su is creating an execution machine. AMD for sure is on the guard against looking like a “one hit wonder” and will need to provide more roadmap insight than their competitors given their share status. 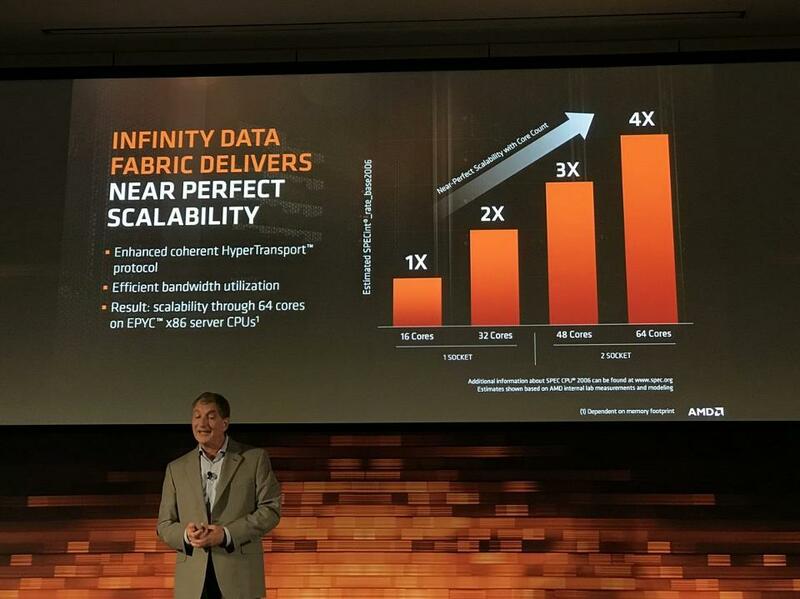 At FAD, Papermaster reinforced Infinity Fabric as a force multiplier, and I’ll be honest, this is the first time I think AMD fully explained the value or the first time it landed. I think the big ah-ha was the de-lidding of EPYC server chip showing the four chips connected by Infinity Fabric with reported linear scaling. The key to any standard fabric is that you can’t give up too much without customization and it’s important it has a roadmap, too. You see, AMD previously did very custom interfaces which required a lot of rework to use those same components again. So with Infinity fabric you get increases reuse, higher yields as you can stitch smaller die together versus massive monolithic die, and drive performance. Papermaster did a great job piecing together how they arrived at the 270% total performance per watt improvement in the Zen core and I was pleased to see much of it was architectural. There were big increases from process improvements too and GLOBALFOUNDRIES is really delivering now for AMD. After Papermaster, it was time for CG SVP and GM Jim Anderson to talk about PCs. He kicked off a deserved Ryzen 7 and 5 desktop victory lap and then spent most of his time unveiling his attack plan for the premium PC market that holds very rich margins and high revenue. As expected, AMD’s “Ryzen” CPUs and then APUs will be the workhorse for this market. I wrote about Ryzen 7 desktop here, Ryzen 5 desktop here. and I can say across all measures, was a successful launch. The silly sell-off after earnings after the market expected three months of sales out in one month was corrected and further makes me scratch my head on traders. Anderson then made a relatively large commitment when he said that Ryzen desktop systems will be launched very soon in all top 5 PC’s including Dell, HP Inc, Lenovo, ASUS, and Acer. I personally saw systems from Dell and Lenovo at the initial Ryzen 7 launch and at FAD AMD was demonstrating Ryzen-based gaming desktops from Lenovo, ASUS and Acer. AMD kicked off Ryzen desktops with the system builders and DIY (do it yourself) outlets, but the real volume comes with the big OEMs. OEMs like Dell, HP Inc., Lenovo and Acer deliver lower gross and operating margin percentages to AMD, but much higher volumes, revenue and profit dollars. Anderson, like Papermaster and Su, committed to staying in high performance markets long-term leveraging performance per-watt improvements as well as better graphics and video. Set to hit the market this summer, THREADRIPPER is a 16 core, 32 thread monster of a CPU in the EPYC socket (with lower bandwidth) which AMD is positioning versus Intel’s Basin Falls. Like Ryzen 7 desktop, THREADRIPPER should perform well in lossless video transcoding applications, physical rendering, bulk image converters, computational fluid dynamics, megatasking (running many applications at the same time), ray tracers, common file compression, encryption/decryption, application compiling, and gaming while streaming. The majority of the PC market revenue and margins are laptops and AMD hasn’t yet released Ryzen for those markets. Ryzen mobile APUs are slated to launch in 2H 2017, will feature the “Zen” CPU core and, announced publicly for the first time, “Vega” graphics. I did a write-up on Vega architecture here and am glad to see they went with the newer graphics architecture. This will be a very interesting risk-return trade-off for the company as it would have been much lower risk to use Polaris. Again, what does AMD have to lose? AMD has committed an ambitious goal of 50% more CPU performance and 40% more GPU performance while only consuming half of the power versus 7th Gen APUs. 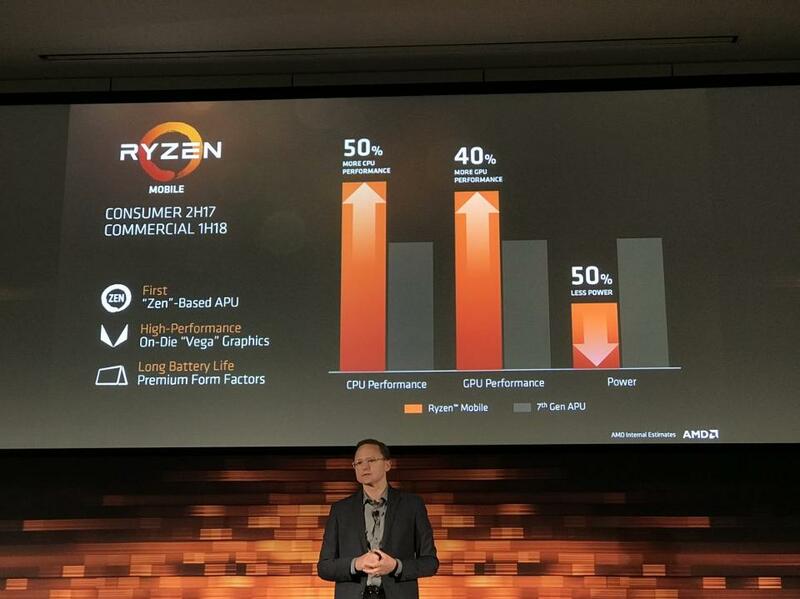 I’ll admit, I was skeptical when AMD first said they could deliver a 40% IPC improvement on Zen and then went on to deliver 50%, so no one should be seriously doubting the new Ryzen APU “50%-40%-50%” promise. While we’re talking SoC here, the CPU team has earned that credibility, has “permission” to make and for people to believe lofty estimates. No one anywhere is laughing now. AMD next showcased their plan for unleashing Vega architecture to attack the premium portion of the market. SVP of RTG Raja Koduri said AMD has its “eye back on the ball,” pertaining to discrete graphics. What did he mean by that? Koduri thoughtfully told the story of how AMD had previously under-invested in discrete graphics while mobility (laptops with integrated graphics) was taking over the world and followed on to describe how AMD has and will increase investments in graphics even more. He discussed how they just completed the “better basics” stage with Polaris with better products, better marketing and showed the resulting 7% Radeon desktop unit share gain. I really appreciated the candor of Koduri’s pitch as I think the group is better off under-committing and over-delivering. Koduri then moved to phase two, the “beyond basics” stage with Vega. The aspirations of “beyond basics” is simple to describe- go where the heat is, and that’s higher-performance workstation pro graphics and machine learning. AMD has always had solid hardware in the Pro graphics area, have made strides the last year in dramatically improving the software and I’m really keeping my eye on how they drive gains here. Pro graphics has been a bit overshadowed by the market fascination with machine-learning-based AI. Machine learning is where the RTG presentation really got really interesting. While Moor Insights & Strategy AI analyst Karl Freund wrote two pieces (research paper and column) on the new “Radeon Vega Frontier Edition”, I’ll quickly say a few words on it. 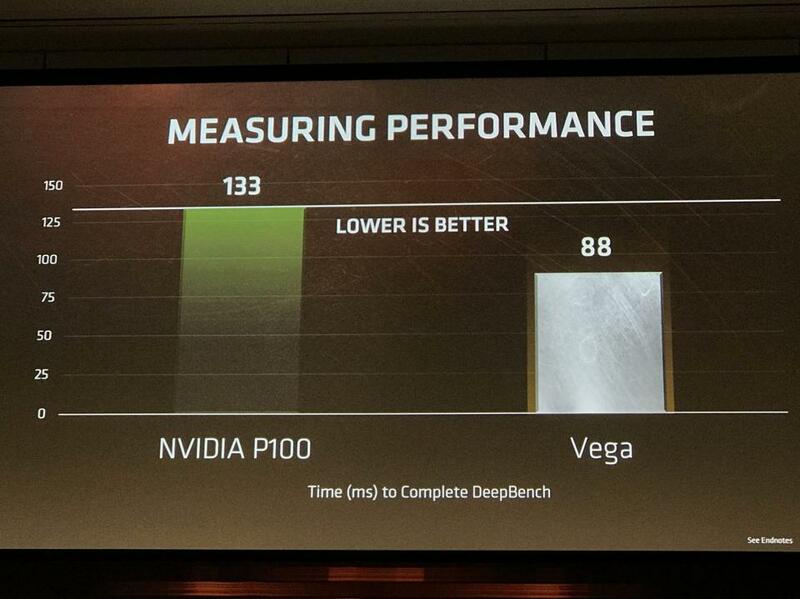 AMD showed their new Vega-based card beating NVIDIA’s P100 in DeepBench by a wide margin. Full disclosure, these were benchmarks AMD ran on unreleased hardware and unreleased drivers. I look forward to third party benchmarks. But as Koduri so eloquently put, he’s not saying he’s wiping the floor with NVIDIA, he’s just glad to be on the chessboard. I loved that Koduri candor again- it worked well. Frontier Edition is set to release in late June and will be targeted at data scientists, immersion engineers, and product designers. It was big day for the datacenter for AMD. Lisa Su discussed it in her opening keynote at length and said the data center was AMD’s single biggest opportunity for growth. As AMD has near 0% share and with that monster margin dollar TAM, I don’t need to create a report to affirm this. When AMD was rocking and rolling a decade ago, it was due partly to Opteron where AMD garnered 25% of the server market with 35% of the market revenue. SVP of servers, embedded and semi-custom Forrest Norrod set the stage for the “new area of the data center” which he says has several requirements including balanced performance, more flexibility, heightened security, and optimized TCO. That all makes sense and Norrod also reinforced that today’s datacenters are different than those of the past and now require heterogeneous computing (CPU+ accelerators like GPU). I had expected an earlier AMD move (server CPU + GPU) here, but I just don’t think they had the resources in 2015 to pull it off. While Su did the big datacenter brand “EPYC “reveal, Norrod added many details to the server story with a few surprises. While I don’t think server datacenter brands are as important as those in consumer markets, they still matter. EPYC brand success will be determined by how well AMD fills the brand vessel and stays consistent with delivering on that promise. EPYC got a good start doing that at FAD in a somewhat surprise move with single socket. At this years OCP Summit, AMD showed how EPYC excelled at massively multi-threaded workloads in a two-socket configuration. This showed how more threads win but didn’t show the strength of its bandwidth, so at FAD, it used a single socket scenario to show this off. AMD showed how a single socket EPYC performed against a mid-range, dual socket Xeon and it fared well, a testament to Infinity Fabric and the memory controller. Therefore, the single socket story is focused on simplicity, less chips, less sockets, and smaller size. The single socket story was real strong and I can think of some CSPs who will be interested. I think AMD has some future tricks up its sleeves on some other EPYC demonstrations and expect to see this drop soon. My confidence in EPYC is rising, but as with Ryzen, I need to see more third parties publish benchmarks and customers commit to deployment. I have seen numerous OEMs and CSPs commit to pilots with many other server CPU vendors but the real win is deployment. AMD’s Financial Analyst Day 2017 was filled some surprises, important commitments, and reiteration of prior commitments. Getting in and staying in the high-performance segments was an important commitment and the entire AMD leadership team committed to it. That’s big. AMD has already demonstrated they can successfully enter the high-performance desktop space, and now need to make Vega, EPYC and Ryzen laptop successful there. Vega looks good so far and it’s nice to see them in the machine learning game, albeit against NVIDIA’s P100, not Volta. I especially appreciated RTG’s softer stance on what gets committed and delivered and it’ll work wonders if they over-deliver on Vega. The EPYC one socket story was a pleasant surprise, is strong, and gives me more confidence but I want to hear from more third parties and hear deployment commits. THREADRIPPER demonstrates staying power in high performance which is a good sign, too. 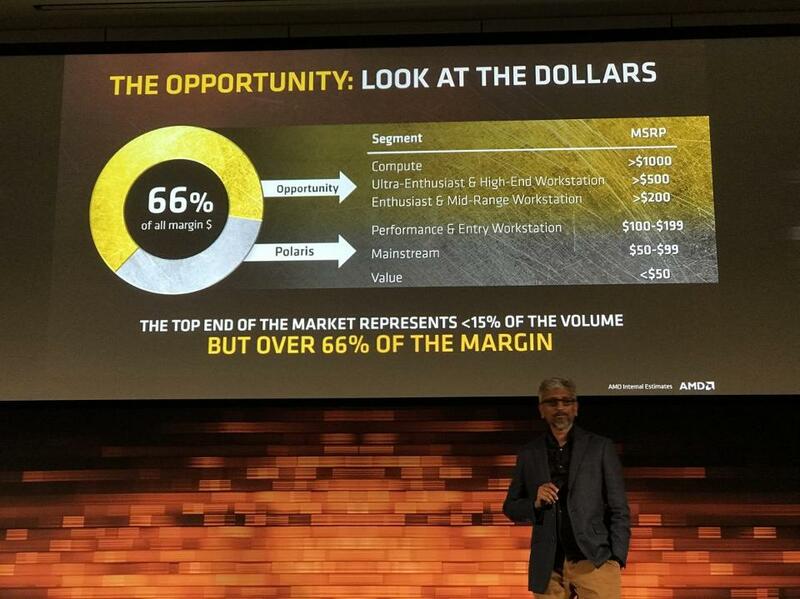 All in all, AMD’s Financial Analyst Day was a banner event for the company and I am simply struck by the difference in the conversations between Tuesday and two years ago. AMD is no longer “on the comeback trail” or just “back”, it has the chance to truly be great again. There’s a tremendous execution between then and now but I think Lisa Su’s crew is up to the task. 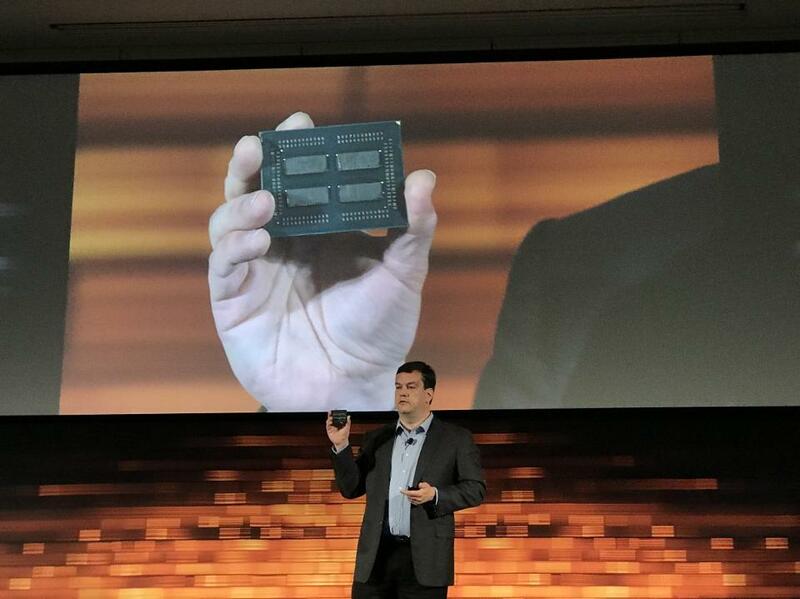 Posted by Patrick Moorhead in CPU GPU DSP FPGA, Semiconductor , Followed with Comments Off on AMD’s Financial Analyst Day 2017: On The Cusp Of Greatness Again?